Most die hard fans of games giant Nintendo have probably heard by now that the storied company was originally a playing card maker. But I bet you didn't know that to this very day you can still buy yourself a brand new set of 任天堂 cards. Yup, that's right, the company that makes 99.99% of its profits from games is still making cards for the Japanese market. Sound strange? Well it kind of is from a business perspective. However, many older Japanese still associate the name nintendo with the traditional card game hanafuda (花札) as opposed to Mario and Luigi. Keeping the card business alive is more of a nostalgic tradition than an actual money maker. Hana fuda is a game that is traditionally played at family gatherings, especially during the New Years holidays. Originally based on Edo-era gambling using Portuguese player cards brought over by missionaries, it involves the pairing of colored cards in order to collect points. 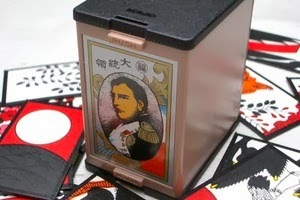 The Kyoto-based Nintendo corporation had the distinction of producing one of the most widely used sets of hana fuda cards in Japan, known as the dai-toryo (大統領) or "president" series. These decks are based on the handmade designs of Nintendo's founder, Yamuchi Fusajiro and are a staple item in most households in Japan. If you are in Japan and you are interested in picking up some Nintendo history, you can navigate on over to Nintendo's そのほかの商品 (sonno hoka no shohin, "other products") page and grab yourself some traditional hana fuda cards. The company also sells other traditional Japanese games such as hyakuninisshu (百人一首), i-go (囲碁), and shogi (将棋).